Humans don’t know much about the universe, but we do know that most of the gravity holding it together—around 85 percent of it—comes from something we can’t see or touch called dark matter. And some other force we can’t see or touch, called dark energy, is simultaneously causing the universe to expand, at an ever-increasing rate. But our measurements that seek to nail down the effects of dark energy don’t seem to be adding up. 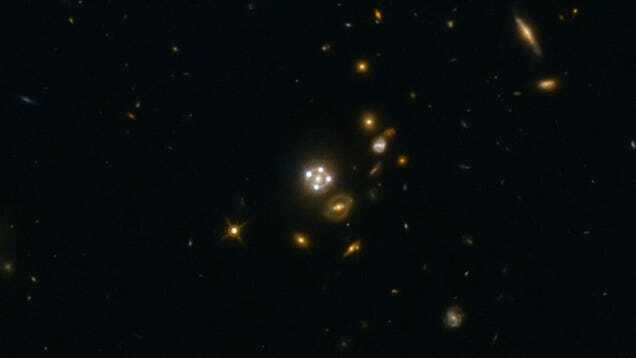 A team of NASA and European Space Agency (ESA) scientists have released several new measurements of the Hubble constant, the number that approximates how quickly the universe expands. These precise new measurements match up with recent ones taken with different instruments but not with other measurements taken of the furthest, oldest observable distances. The whole story together paints a frustrating picture of the way scientists must establish facts about our universe. Scientists have long sought to measure the Hubble constant, and the expansion of the universe. Observations as far back as the 1950s have given values somewhere between 50 and 100 kilometers per second per megaparsec of space—meaning galaxies 3.3 million light years from us move away at anywhere from 50 to 100 kilometers per second. Last year, the ESA’s Planck satellite measured an expansion value around 68 km/s/Mpc by observing the cosmic microwave background, invisible light found everywhere in space that originates a few hundred thousand years after the Big Bang. But as Gizmodo reported previously, the Hubble Space Telescope also attempted to measure the Hubble constant last year, by looking at much closer stars and supernovae. It arrived at a value of around 73 km/s/Mpc, suggesting our universe is flying apart five to nine percent faster than we thought. That was a pretty crazy revelation to the physicists who discovered it, and it suggested that a deeper dive would be needed to reconcile the different measurements. Now, another set of measurements taken by a completely different experiment seem to confirm the Hubble Space Telescope’s surprising measurement. Researchers from the H0LiCOW (short for H0 Lenses in COSMOGRAIL’s Wellspring, pronounced Holy Cow) collaboration measured the Hubble constant by looking at how gravity causes light from distant galaxies to bend around quasars, super bright high-energy objects that people think might be at the cores of galaxies. As the quasars flicker, so do the images of the galaxies behind them, which helps scientists determine the distance the light had to travel. The researchers published their results in a series of papers in the Monthly Notices of the Royal Astronomical Society. Even with the H0LiCOW data in the mix now, the new Hubble constant measurement and the one determined from the cosmic microwave background aren’t statistically separable to the very high degree of significance astrophysics demands, Anže Slosar, group leader of the Cosmology and Astrophysics Group at the Brookhaven National Laboratory in New York, who was not involved with the study, explained to Gizmodo. Physicists require overwhelming proof that something in the universe hasn’t happened by chance, far more than, say, doctors do when testing whether a medicine cures a disease. So, if technically nothing is statistically different between the new HoLiCOW measurements and prior measurements of our universe’s expansion, why is this news? Well, a new experiment confirmed a completely different experiment. In science, that’s one of the most important things that can happen—two experiments verifying the same results in completely different ways. Frustratingly enough, the new evidence in this case didn’t lead to a new physical discovery. Instead, we’ve got more evidence to prove that we might have two different values for the expansion of the universe, and we’re not yet sure why that would be. That’s just how science works, and if we’d like to continue learning new things about our universe or even ourselves, sometimes it takes a long time, costs a lot of money, and involves lots of incremental but inconclusive results along the way.